The Facades+ PERFORMANCE conference is just around the corner. Join me and other great speakers and instructors in Chicago on October 24-25 for some fantastic presentations, discussions and workshops! I will be moderating the Innovation panel discussion on October 24. We will discuss how new information-based technologies are informing the contemporary discourse on building and facade performance. Dynamo is an open source graphical programming language for Autodesk Revit and Vasari. Dynamo can be used to customize a wide variety of computational design processes within Revit’s Building Information Modeling environment. This workshop will explore how Dynamo can be used as a took for studying parametric facades. Participants will learn how to use Dynamo for generating facade geometry, deploying Revit families, utilizing analysis information, and managing complex parameters. Custom user nodes can be installed through Dynamo's package manager. 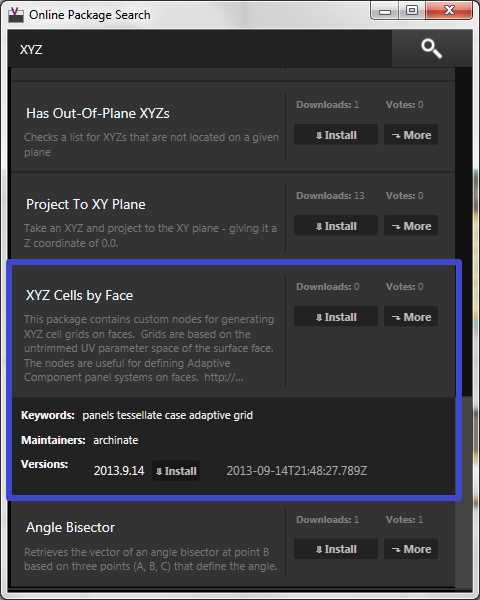 The new Dynamo package manager... nice concept for distributing custom nodes! Crossing the Streams... with more Interop! So you may have noticed that many of the interoperability studies have been one-way connections from Grasshopper into Revit. More often than not, we have found that teams are generally following a linear path for design to production with the Revit model and drawings being the final deliverable. Technically, however, the solutions we have been developing are quite non-linear in nature... data is free to move in any direction through senders and receivers. Here is an example of moving data from Revit into Grasshopper. There may be any number of reasons you might want to do this... For example, creating references to key project datums, developing systems in relation to Revit geometry, or even simple data visualization. The interop process creates a live link between Revit elements and the Grasshopper model. Once the data is in Grasshopper, it can be used for reference or as the basis of a definition.